Childhood | "It's fruitcake weather!" This is what makes Candy Crush so addictive. Ultimately, there is no goal. So no one is ever going to be able to say “I’ll be finished after this quest!” … Nope. You’re trapped. You get to “interact” with Facebook friends. Since none of us are willing to spend money to advance in Candy Crush, the game makes you send loads of requests to your Facebook friends to provide you with “tickets” to advance instead. This draws even more people into playing the ultimately pointless game. You can, as a result, “Play with Friends” as shown in the top right corner. Its supposed to fulfill our need for human connections. Lovely. I suppose I can keep playing Candy Crush at the expense of real-life relationships. Send me more lives and we’re cool. PEER PRESSURE. 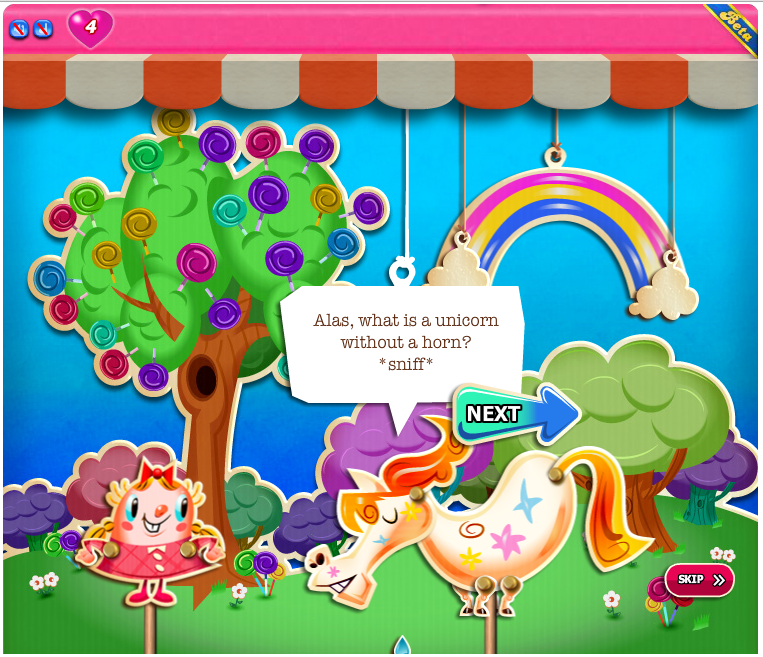 CANDY CRUSH SHOWS YOU RAINBOWS AND UNICORNS.